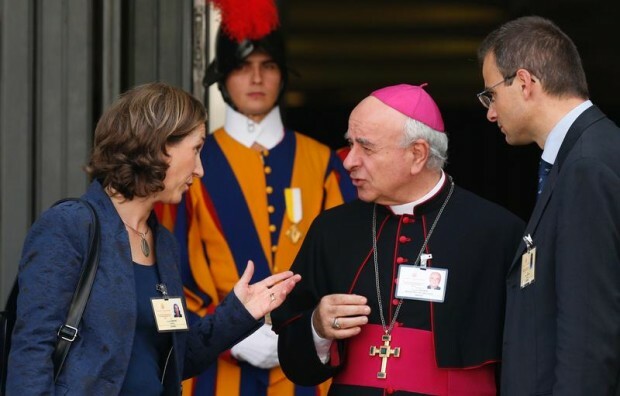 VATICAN CITY (CNS) — Archbishop Vincenzo Paglia, head of the Pontifical Council for the Family and lead Vatican organizer of the World Meeting of Families in Philadelphia, has been dropped from a criminal investigation. An Italian investigating judge ruled Sept. 21 that the archbishop was “completely un-involved” in a scheme to purchase, then resell at a profit a 14th-century Italian castle. The judge made the decision after the public prosecutor’s office filed a motion to dismiss the archbishop from the investigation. In December 2010, the town of Narni sold the castle property, which once had been a Franciscan monastery, to a group of buyers headed by a diocesan institute for 1.76 million euros with the proposal of turning it into a four-star tourist accommodation. The local public prosecutor and local police opened an investigation into the property deal in 2013. The lawyer explained that the decision for the diocese to be involved in the purchase had come from the archbishop’s predecessor, Bishop Franco Gualdrini, who died in March 2010 — nine months before the initial sale went through. Archbishop Paglia had only indicated that the diocese was among the bidders, but then had no further knowledge of what happened during the bidding process, Morcella said. The World Meeting of Families is hosting tens of thousands of people from 150 countries for four days of conferences and activities focusing on the family from Sept. 22 to 25. Pope Francis will visit Philadelphia Sept. 26-27 to cap the families’ congress and his first trip to the United States.